February 16, 2019 — A Chevrolet Malibu recall is ordered to fix driver frontal airbag inflators that could explode, and the problem isn't caused by Takata inflators. General Motors says more than 1,100 model year 2010-2011 Malibus are equipped with ARC driver-side airbag inflators that could overpressurize and rupture when the airbags deploy. In November 2017 GM was contacted by an attorney who represented a Chevy Malibu driver who was allegedly injured when the airbag inflator ruptured. GM contacted federal safety regulators to inform them of a possible problem, but the automaker says it couldn't get access to the Malibu for inspection after multiple attempts. However, the GM was finally given access to the Malibu and engineers determined the inflator likely overpressurized and ruptured. Although no other reports have been received about exploding ARC inflators, the automaker talked to the National Highway Traffic Safety Administration and made the decision to recall the cars. Malibu owners may have already received letters describing the safety risk and how Chevy dealers will eventually replace the front driver's side airbag modules. Customers will receive second notices when dealers are ready to perform the work. 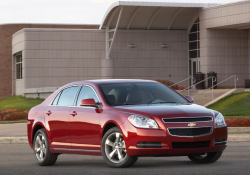 If you own a 2010-2011 Malibu and have concerns or questions, call General Motors at 800-522-9559 and ask about recall number N182206630.